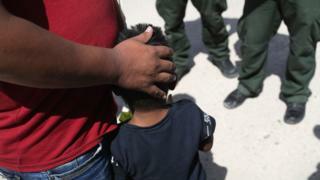 Figures from the US Department of Homeland Security show that 1,995 children were separated from 1,940 adults who are being held between 19 April and 31 May. No information was given on the age of the separated children. The children are passed into the care of the US Department of Health and Human Services. They are transferred to government detention facilities or foster care while officials try to resolve their case. 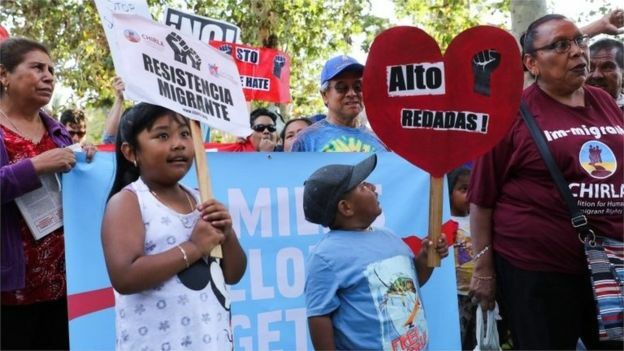 The United Nations has called on the US to immediately halt the separations. Mr Sessions said having children would not shield border-crossing migrants from prosecution. The attorney general quoted a verse from St Paul's Letter to the Romans on obeying the laws of government. The Trump administration policy is supported by some Republicans, but others have expressed misgivings. Speaking to reporters on Thursday, House Speaker Paul Ryan, Congress' highest-ranking Republican, said he was not comfortable with the tactics. This week, House Republicans pitched draft immigration legislation that would end the separation of children and parents at the border. Under the plan, families would be detained together. Also in the proposal are provisions to protect 1.8 million Daca 'Dreamers', eliminate the diversity lottery, and add $25bn (£18bn) for border security. The bill, a compromise between moderates and conservatives, is expected to be voted on next week. So will another, more hard line bill. President Donald Trump said on Friday he would not sign the compromise bill, despite Republican lawmakers having said he supported it. His remark sent legislators on Capitol Hill scrambling, but the White House later said the president had misspoken and he would back both measures.